Any fragments hit by the boss or add blast are removed. It spawns on a random players location and does damage on impact and has 3 abilities, the first one being a copy of the boss blast ability. The second one being a new ability called Void Echoes which does raid damage and for each subsequent cast it deals 50% more damage. The last ability being a mirror to the boss beam in the intermission, the boss beams the add and the add beams a player. When damaged to 50% hp it goes away. Strategies wise its rather straight forward the abilities repeat itself just like on heroic which means it is more about mechanical skill rather than executing a strategy as you deal with each ability in the same order throughout the entire fight. There is a few noticeable differences for example every time the add spawns it is crucial every player runs in to melee to bait it to make sure melee have an easy time hitting it and also not losing any possible cleave damage on to the boss. The add is absolutely the highest priority and needs to be tunneled down every time it spawns the goal is always to only have 2 adds per phase 1 and to only have 2 void echoes per add. The orbs are not as exclusive for tanks any more considering blasts consume all orbs it comes across which means the rest of the raid is not just welcome to but is endorsed to pick up any orbs that is about to be consumed. The rest of the abilities is more like restrictions on how to handle with abilities than anything else. When you have ruin, plan ahead which path are you going to take, there is plenty of time to think through all scenarios and the most devastating one would be to run over other players as the orb is about to spawn. Whenever you have the debuff in a cluttered area simply wait for the orb to spawn and then move to back of the room unless you already have a clear path. Speaking of the orbs they have a complete dps stop unless permission is granted to touch them, different players will be responsible for different parts of the room but because of different unpredictable outcomes the designated player might not be able to for fill their duty in which case a backup will be asked and must confirm over voice before taking any action and thinks are going at high speed in this fight so there is no time sleeping on the comms. 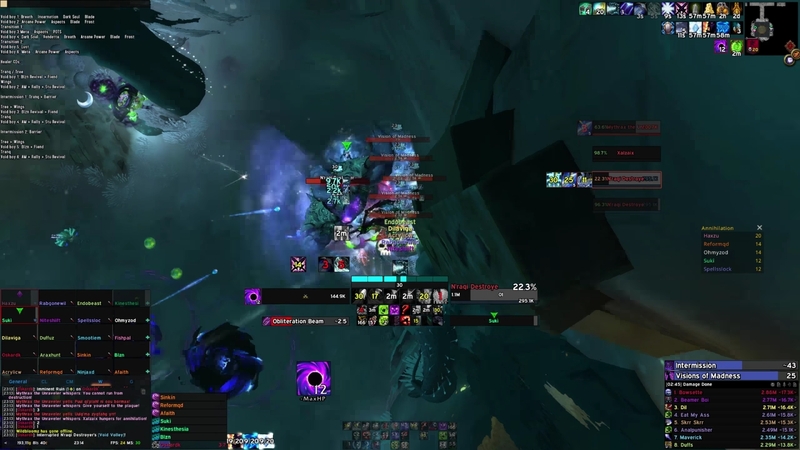 The first noticeable difference is that the boss will be tanked in the center of the room but still faced the same way to give more space for the raid to utilize but more importantly to still be spread while baiting the add spawn. 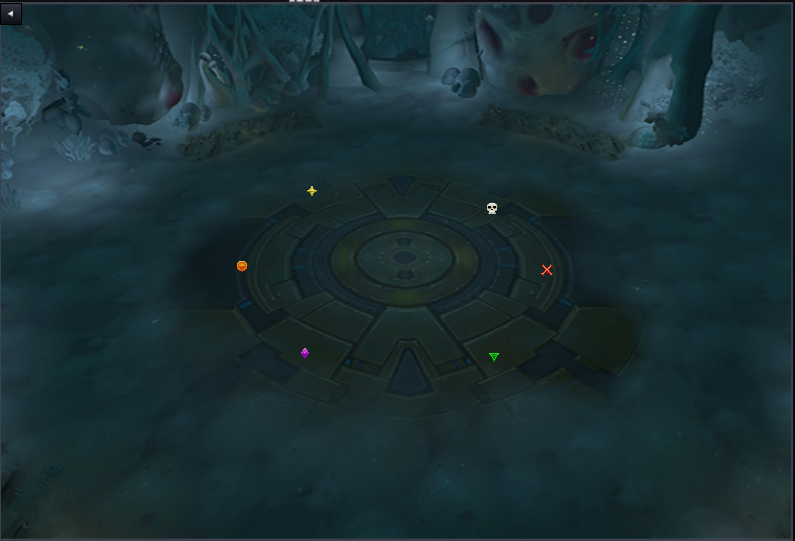 The raid will be split in to several different areas of the room toughest has the melee obviously just remember you have 2 possible places to spawn orbs per position as you can both be max melee range and as close to the boss as possible in case you would get additional orb spawns in the same phase. In the intermission everyone but a tank and a healer will be on 1 side with the help of warlock pets we can interrupt all the casts without having to send a dps over risking having a bad vision spawn. To better stack up all the adds we are going to be using 2 particular spots in the room which forces the adds to spawn in such away that they are at best all stacked up and at worst spread in a half moon. Every time the beam goes out we move together to hit 2 birds with 1 stone as we do not have to worry about ever getting hit by the beam anymore considering we are all stacked meaning we are essentially baiting it and then moving away from it together. Just like on Vectis I have another green circle indicating if you are too close to another player or not.